Photo by "Milad Avazbeigi":http://www.flickr.com/people/milad-avazbeigi-photography/ via Flickr. From time to time, I’ll give an overview of one broad MediaShift topic, annotated with online resources and plenty of tips. The idea is to help you understand the topic, learn the jargon, and take action. I’ve already covered Twitter, citizen journalism, alternative models for newspapers and other topics. This week I’ll look at Iran election news online. After the presidential election in Iran on June 12, incumbent president Mahmoud Ahmadinejad was declared the winner by a large margin not long after the polls closed. Then came questions about whether the vote was rigged, and rival candidate Mir-Hussein Mousavi called for protests. 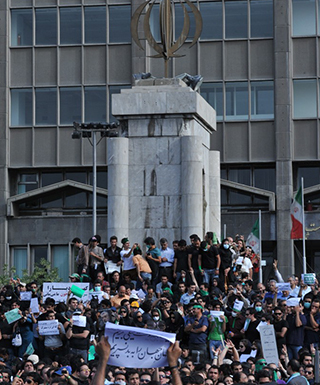 The resulting chaos involved mass protests, violence and killings in the streets of Tehran and other cities in Iran, and calls for a new election. During it all, Iran’s government arrested journalists, would not allow them to report on protests, and blocked Internet sites or slowed down Net access to make it unusable. played key roles in getting news out of Burma during protests by monks there. And the wider global blogosphere helped bring attention to jailed bloggers in Egypt, China and Iran in 2006, leading to their freedom. In late 2004, citizens helped capture the destruction of a massive tsunami in Southeast Asia when major media couldn’t reach disaster zones. But what was different this time was that more Westerners were connected through social networks than ever before. So when news started spreading through Twitter under the #IranElection hashtag, anyone on Twitter could follow reports as they came in minute by minute. Not only could they read what was going on but they could take action, re-tweeting accounts they trusted as true, and changing their photos green in solidarity with protesters. The myth of this being a “Twitter revolution” was quickly debunked because so few people in Iran were using Twitter, and the authorities could easily go onto Twitter and subvert the memes being spread. But what made Twitter so powerful was its ability to get news out of the conflict zone to the wider world. And Twitter is extremely difficult for authorities to block because of its open API, meaning that people could continue to get news out by text-messaging or via apps such as Tweetie or Tweetdeck even if Twitter.com was being blocked by the government. Plus, Iranians have long had to deal with the government blocking websites, so they know about getting around those blocks. And they have a flourishing blogosphere accustomed to organizing to help out jailed bloggers or to get information out when the state-run media is censored. What’s happening online is that the people formerly known as news consumers are now given access to all the raw material being captured by eyewitnesses. What is truth and what is fiction? Who is there and who is pretending to be there? Where and when was that video captured? How do I know that Twitter feed isn’t from a government agent posing as a protester? Soon the viewer starts to figure out that there are various levels of trust they can associate with what they find online. There are the raw unverified feeds found via Twitter hashtags and Flickr tags. Then there are users on those services that have been reporting for a number of days, and who have been quoted or verified by others as being legitimate. 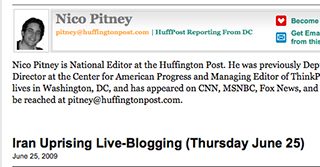 Then there are sites such as Global Voices Online that have editors who know which bloggers to trust. Then there’s the cell phone video of Neda Soltan, a young Iranian woman who was shot in the street and died. That video started as raw and unverified and eventually was shared, passed around, and the story and context came out to the wider world. Over time, we start to find places online where we can trust the content, where people have proved their value in sharing valuable pieces of information. And they’re not just trained editors and journalists at news organizations, though those people also play a role in verifying information, when possible, and providing context. 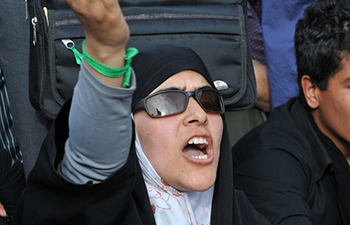 Here’s a roundup of some of the best sources on the fallout of the Iranian election. This list is just a start. Please add any trusted sources you have found to follow the news in Iran in the comments, and I’ll update my list with any glaring omissions. Protest photos by Milad Avazbeigi via Flickr. Hi Mark — FairSpin (http://fairspin.org) is a site where readers work together to reveal the bias behind political news and opinion. (Full disclosure: I am a co-founder.) Last week we added a page that tracks the latest on the Iranian election and applies FairSpin’s bias rankings to separate the opinion pieces from factual news. Though the stories are starting to slow down, it has been interesting to observe how the left and right are reacting to both the events in Tehran and the Obama administration’s response. This is an experiment for us (as is FairSpin itself), so we welcome any feedback. Interesting experiment. Not sure that I trust reader votes on how to mark down bias but it’s one way to categorize news, I guess. I added your site to the list under Aggregated Information. Check the Dart Center blog ( http://dartcenter.org/blog ) for related essays and posts, as well as a forthcoming forum roundup. I offer Azadi4Iran.info which Jose Antonio Vargas featured in his Washington Post article. I have had a serious problem with twitter and a strange group of hackers outside Iran interfeering and causing problems in the struggle for democracy. Doubt they will get a proper election there in the next 10 year. Oh it might look like democracy in the newz we hear, but if you talk to the medias down there it’s a completely different story.